Why Prague was became top 10-city destination in Europe? According to Euro monitor International, Prague is one of the top 10-city destinations in Europe. 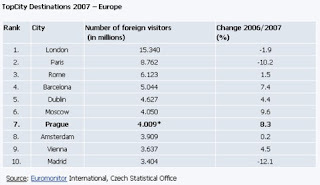 The stats shows that Czech Republic is very popular city destination in Europe, millions tourists came to this place every years. It is very possible because The Czech Republic is a land that blessed with an exceptional number of historical monuments of all architectural styles, a rich range of cultural offerings, pleasant spas and wonderful nature and natural beauty. Many tourist attractions that must have to visit when you travel to Prague, tourists accommodation like Prague apartment rental or hotel is significantly important for us to enjoy all tourism attraction in Prague. The Czech Republic has Prague as the capital of the Czech Republic. 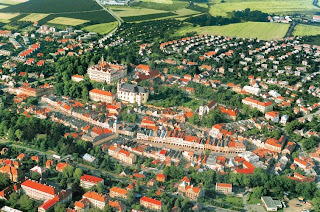 It has an area of 496 km2 and is home to 1,200,000 people. Prague is not a huge distance from other central European cities. Prague is situated in the heart of Europe. Prague is only 300 km away from Vienna, Bratislava 320 km, Berlin 350 km, Budapest 550 km, Warsaw 630 km and Copenhagen 750 km. The River Vltava flows through Prague for 31 km, and at its widest measures 330 m. Prague’s historical centre has an area of 866 ha (Hradčany and Prague Castle, Malá Strana, the Old Town including Charles Bridge and Josefov, the New Town and Vyšehrad). Since 1992, UNESCO has listed it as a world cultural heritage site, Prague Castle is the largest medieval castle complex in Europe and the ancient seat of Czech kings throughout the ages. It is Prague's premier tourist attraction. Today, Prague Castle is the seat of the President of the Czech Republic and serves as the historical and political centre for both city and state. The Prague Castle complex consists of Saint Vitus Cathedral (the most recognizable landmark in the city), viewing towers, museums and art galleries, a monastery, Golden Lane, several palaces, including Lobkowicz Palace, and St. George's Basilica; the latter being a popular venue for early evening classical concerts. The Czech Republic can boast a full twelve historic areas inscribed in the UNESCO Register of World Cultural and Natural Heritage, as well as one UNESCO geopark. All of these monuments are nonetheless easily accessible; there are trams, metros and buses to explore the charismatic place. No other concentration of UNESCO-registered sites can be found anywhere else in the world. There are also many others tourist attraction that must have to visit when you are travelling to Prague such as Folk traditions and folklore, sport events, open-air festivals, film festivals, etc. About folk traditions and folklore, there are largest folklore festivals in the summers, a music festival about folk songs and dances with the folk costumes. About sport event, there are sport event like The World Motorcycle Championships. About open-air festivals, there are open-air festivals like festival that featuring musicians in all variety of genres from world music to rock and alternative. Well, so many interesting place must be visited, have you prepared for the accommodation such as hotel or apartment reservation. The important things are to choose fully equipped and fully services apartment such as Cool Prague Apartments. @Baka Kelana: Thanks alot n sharing too..
@Suryaden:really a good comment & addition..